Gordon McCord, an assistant teaching professor of economics at the School of Global Policy and Strategy, serves as a senior advisor to SDSN and represented the campus at the Dec. 4 launch. With the world’s population expected to grow to 9.8 billion by the year 2050 and incomes rising, land shortages are expected to hinder efforts to feed the global population. Today, food and land use system inefficiencies are already the driver of both malnourishment and obesity. So, how can the global community prepare for this international crisis? Enter the Sustainable Development Solutions Network (SDSN), a global program that mobilizes scientific and technological expertise to create practical problem-solving for sustainable development through the United Nations (U.N.). Created in 2012, SDSN is charged with implementing both the Paris Climate Agreement and Sustainable Development Goals—bold global objectives U.N. member nations set for themselves to end poverty and hunger, ensure access to quality healthcare and education for all and protect the environment by the year 2030. 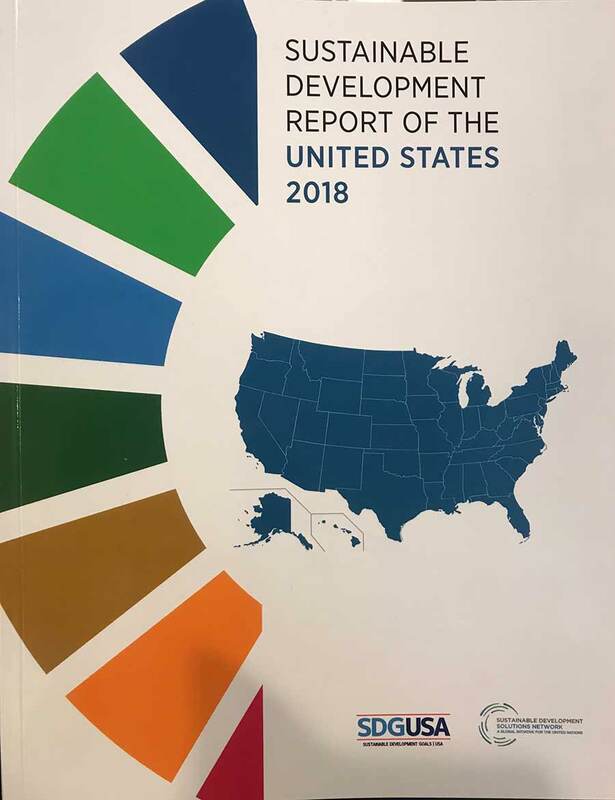 The Sustainable Development Solutions Network (SDSN) is charged with implementing both the Paris Climate Agreement and Sustainable Development Goals. The network brings together universities, research centers, as well as other knowledge institutions. The broad international organization includes regional networks that have commenced in dozens of countries thus far. In the United States, UC San Diego, along with Yale and Columbia, play a key role as host universities to the network of more than 100 higher education institutions from nearly every state. The network officially launched Dec. 4 in New York. “UC San Diego’s strengths, particularly in engineering, medicine, environmental management and social sciences, makes us a natural leader in helping solve the complex challenges of sustainable development,” said McCord. 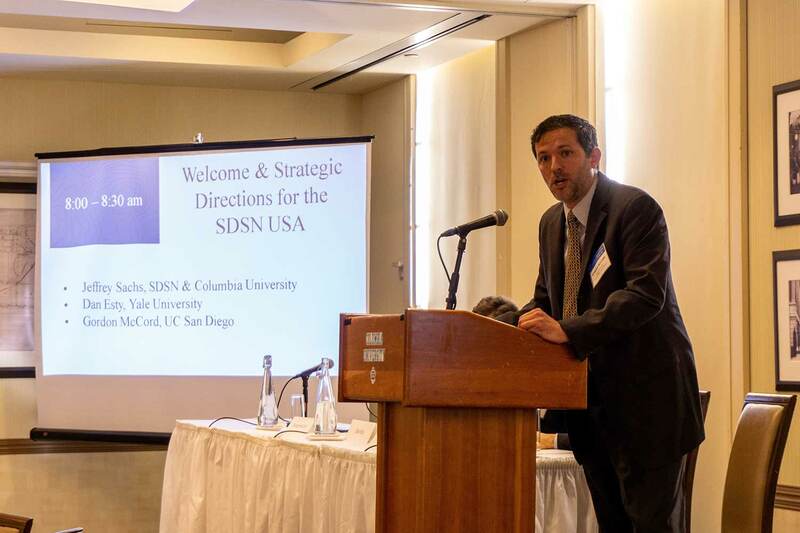 As a host university, UC San Diego, Yale and Columbia convene colleges and institutions around the country and promote the work of the network in a number of ways. Collaboration across higher education institutions and disciplines is critical to the program’s success. Solving complex problems is at the center of McCord’s research, which intersects the development of economics, public health and the environment. He has extensive experience advising developing country governments on integrated rural development and poverty programs using data-driven approaches. One project McCord is heavily involved with—called FABLE—is already underway as an SDSN initiative. FABLE mobilizes scientific teams from countries around the world to inform their governments’ policy choices on land use. This is done by generating land use pathways that are consistent with feeding growing societies over the next three decades while aligning with sustainable development and the Paris Agreement. “As nations get wealthier, diets shift towards animal products, and as we’ve seen, this puts tremendous strain on land use,” McCord explained. The constraints are so daunting that some scientists have suggested that if society keeps going this route, all humans will have to adopt vegetarian diets by the end of the century in order to avert extreme climate change and preserve biodiversity. “For the first time, we are trying to present a set of choices to policymakers so we can manage the challenge of producing food without taking land away from other critical needs,” McCord said. FABLE mobilizes top knowledge institutions across the globe to support the development of the data and modeling infrastructure needed for long-term pathways towards sustainable food and land use systems. Finding pathways to feed the population in 2050 in ways that do not destroy ecosystems, support biodiversity and reduce greenhouse gas emissions is no easy task. However, McCord is not alone in his pursuit of tackling intricate challenges facing the globe today and in the years to come. As a professor within the School of Global Policy and Strategy, faculty at the school are dedicated to carrying out its mission of conducting pioneering research with a real-world impact through advanced methods to design, test, evaluate and refine solutions for global societies. These efforts are recognized throughout this academic year with several engaging events and initiatives as the school celebrates its 30th Anniversary. McCord’s research is a natural fit for SDSN, and additional faculty from the school and across the campus will soon engage with the network. For more information, visit the Sustainable Development Solutions Network.